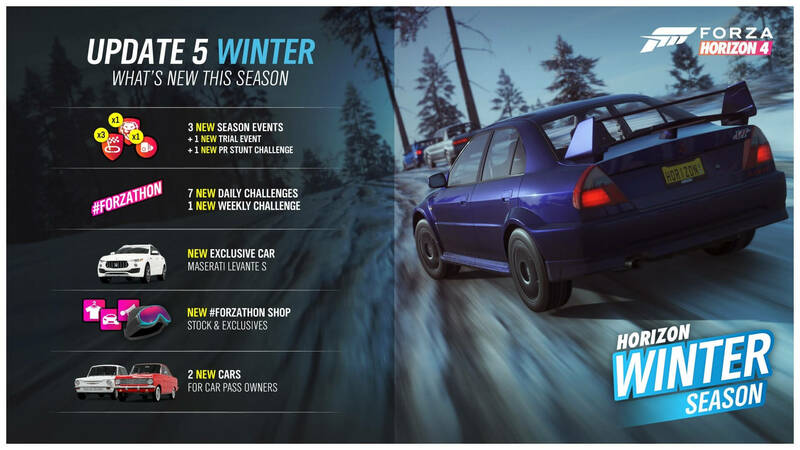 The penultimate week of Series 5 in Forza Horizon 4 has arrived and with it, Britain has turned into a Winter Wonderland for the next seven days – topped with new cars, seasonal challenges and snowy events to compliment the arrival of these chilling conditions. Moreover, the Derwent Water has frozen over this week to deliver some slippery fun. It’s also where you’ll find a drag strip that’s exclusive to this perilous season. Forza Horizon 4’s weekly seasonal changes are designed to allow players to always have something new to discover with each passing week in both beautiful, historic Britain and the standalone Fortune Island experience. As a reminder, the seasonal change in Forza Horizon 4 occurs every Thursday at 2:30pm GMT (9:30am EST, 6:30am PST) – with next week seeing the arrival of Spring and introducing a fresh, crisp atmosphere into the air. Below, we’ll have a look at everything that’s new to discover this week in Forza Horizon 4. 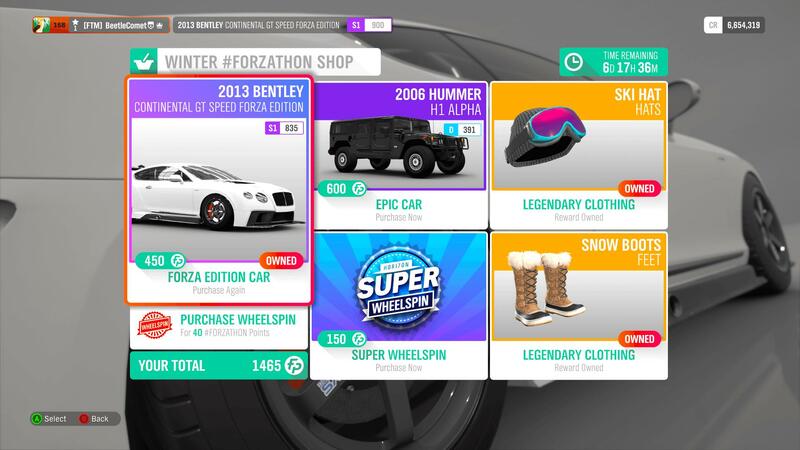 From new types of Seasonal Championships to unmissable new cars, this is your ultimate guide to everything new in Horizon Life this Winter! 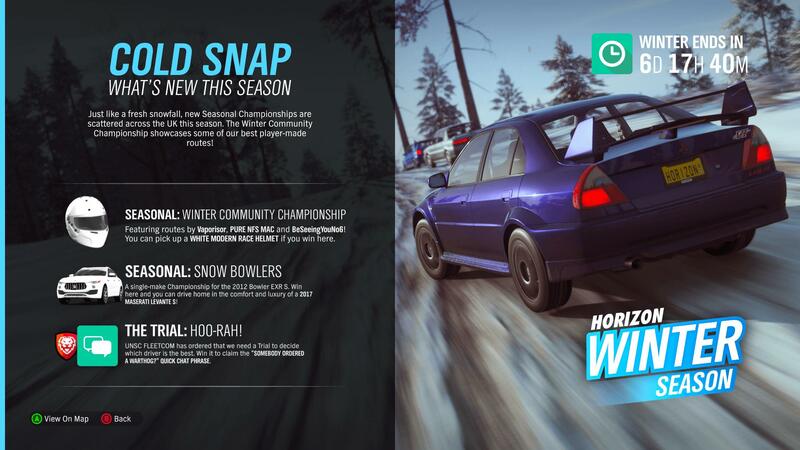 Following in the footsteps of the recent Summer and Autumn Seasonal Championships, the slate of Winter experiences in Forza Horizon 4 will have you enjoying a mixture of both community-created events and the usual line-up of curated festival races. Up first, we have the ‘Winter Community Championship,’ featuring a line-up of race events that have been made using the built-in Route Creator. These events have been handpicked by developer Playground Games and offer the White Modern Race Helmet to compliment all the recent Race Suits added to Forza Horizon 4 throughout Series 5. After that, there’s the ‘Snow Bowlers’ Championship that sees you behind-the-wheel of the 2012 Bowler EXR S to win a 2017 Maserati Levante S – the latest exclusive car to arrive into the game, and one that was first introduced to the Forza franchise with the release of the K1 Speed Car Pack for Forza Motorsport 7 last April. The Trial is also back in Forza Horizon 4 this week and this one is all about Halo! It’s called “Hoo-Rah!” and it’ll see you driving Master Chief’s beloved Halo Warthog as you cooperate with 5 other drivers to take on a team of Drivatars set to Unbeatable difficulty. Successfully beat the Trial and you’ll unlock the “Somebody ordered a Warthog?” catchphrase for Quick Chat. Elsewhere, the ‘Naughty but Nice’ Seasonal Championship sees you competing in a dirt-focused series allowing you to earn bonus credits, wheelspins and the supercar masterpiece that is the 2008 Lamborghini Reventón. There’s also this week’s Seasonal PR Stunt, which shines the spotlight on the Broadway Windmill Danger Sign by the English Cotswolds with a designated jump target of 1,499.3-feet. Beating the challenges offered by Seasonal PR Stunts will grant you a bonus Wheelspin or Super Wheelspin. 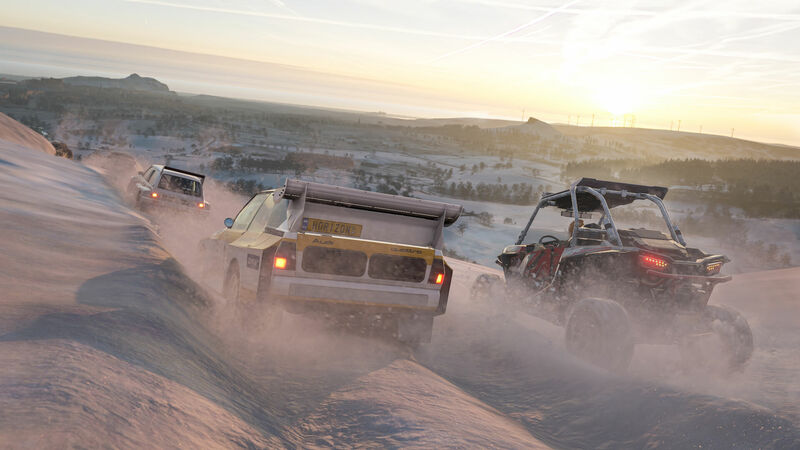 The Winter seasonal fun doesn’t stop on the mainland as Fortune Island has three additional Seasonal Championships for players to check out, including series for asphalt, dirt and cross-country racing. ‘Rally Skildar’ sees you in B Class Modern Rally Cars against the island’s harshest weather conditions, ‘Lowland Tour’ sees you in B Class Hot Hatches as you avoid sliding off the road into snow-filled ditches, whilst ‘Causing A Stir’ challenges you to battle your opponents in B Class Off-road Vehicles. Fortune Island also has two new Seasonal PR Stunts available to complete this week. The Viking Bay Trailblazer Gate challenges you to reach your destination with 38 seconds or more left on the clock. Meanwhile, the Storm Cove Danger Sign requires you to jump at least 492.1-feet using the vehicle of your choice. Completing Fortune Island Seasonal Championships and PR Stunts will see you earn additional Wheelspins that can unlock a variety of unique items, including bonus credits, rare cars, vehicle horns and clothing. Fortune Island will continue to receive an assortment of dedicated Seasonal Championships and PR Stunts every Thursday to accompany the mainland season change and these will always remain exclusive to owners of the expansion. This week’s Forzathon event celebrates historic rally machines as you get behind-the-wheel of your favourite Retro Rally car in ‘Fond Memories.’ You’ll need to successfully earn 5 Airborne Pass skills during race events, followed by 5 Lucky Escape Skills. 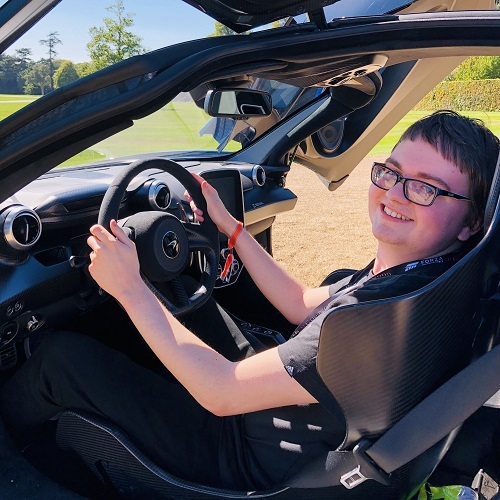 Rounding off this weekly event is a 3-star PR Stunt challenge, in which you’ll need an average speed of at least 95mph at the Derwent Water Speed Zone. Every week, the Forzathon Shop replenishes its stock of exclusive cars and clothing items, and this week is no different. 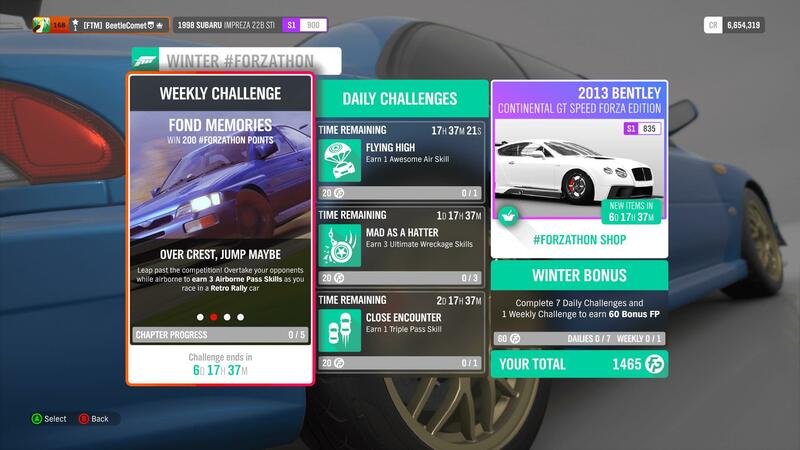 In terms of cars, we have the 2013 Bentley Continental GT Forza Edition for 450 Forzathon Points and the 2006 Hummer H1 Alpha for a costly 600 Forzathon Points. It’s worth noting both cars were previously only acquirable from the Auction House or Wheelspins. You’ll also find the Ski Hat and Snow Boots Legendary Clothing items available for purchase from the Forzathon Shop this week. 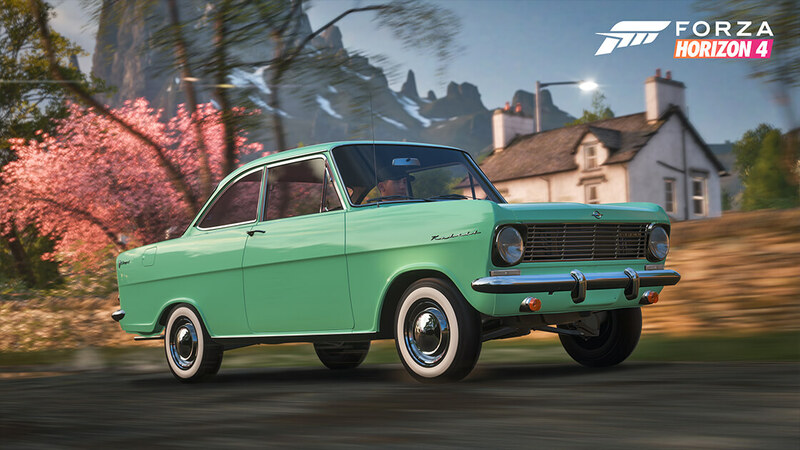 This week’s Car Pass additions include two iconic classics of motoring heritage from the 1960s, including the 1966 Hillman Imp and the 1963 Opel Kadett A – both of which are ready to dominate the British racing scene in Forza Horizon 4. Remember, these rides are available to add to your in-game garage today at no additional cost if you own the Forza Horizon 4 Car Pass, included in both the Deluxe Edition and Ultimate Edition of the game. The Forza Horizon 4 Car Pass can also be acquired separately and is discounted for Xbox Game Pass subscribers. 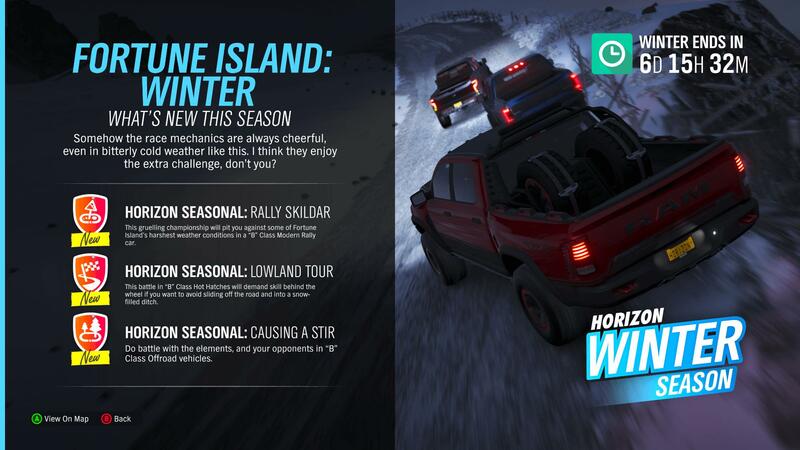 Experience the Winter season this week in both Forza Horizon 4’s Britain and Fortune Island until Thursday, February 7th. 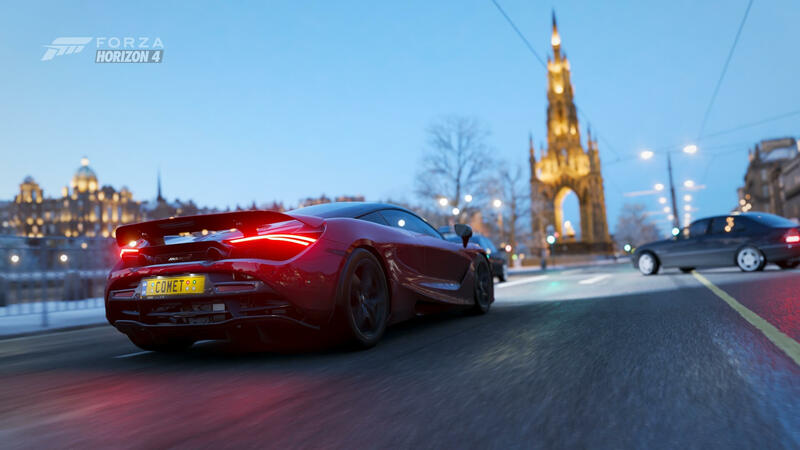 This is when the next seasonal change will occur in Forza Horizon 4 as we welcome the arrival of Spring and its slate of fresh events, challenges and cars. In the meantime, if you missed out on collecting the Winter Barn Find, it’s available to acquire once again over the next seven days on an island in the middle of the frozen-over Derwent Water. You can see why it’s exclusive to this time of year. Find it and you’ll unlock a classic British automobile in the 1970 Range Rover, which will be repaired and added to your Forza Horizon 4 garage once its ready.